From the airport "Fontana Rossa" located in Catania, we can reach the Hotel Jonic Mazzarò in the following way: by bus from the airport to the Hotel Jonic in about 50 minutes; by a taxi we can arrive directly to the hotel "Jonic" in about 30 minutes. The price is about of 70/80 Euros. For more comfort you can rent a car, then take the motorway A18 in direction of Messina and exit at the junction Taormina. 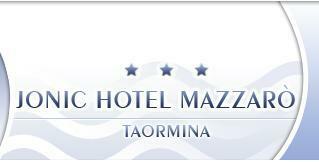 Continuing towards the Bay of Mazzarò, after about 1 Km, you will find the indication of the Hotel Jonic Mazzarò. Our guest who will arrive by train from any destinations, will have to stop in the railway station of Taormina - Giardini Naxos. To reach the Hotel Jonic Mazzarò they can choose between a taxi or a line bus. The distance from the railway station is of about 2 km. Taormina. From the junction continue in direction of Mazzarò - Taormina Mare and after about 1 Km you will find the Jonic Hotel Mazzarò. For those who are in the historical heart of Taormina, they can easily reach the Hotel Jonic using the cableway service with destination Taormina Sea. The hotel is located at about 50 metres from the terminal.